The Lynmoore Symphony Manor of Richmond — JSR Associates, Inc. The Lynmoore Symphony Manor of Richmond, located in Richmond, Virginia, is an example of a low-budget yet high-impact renovation that updated an existing three story, 120 room, 1980’s senior living facility. Hired to redesign and reconfigure the public spaces, JSR Associates, Inc. focused on de-institutionalizing the facility by using indirect fluorescent lighting, creating a more residential scale, specifying sustainable carpeting and recycled content wall coverings, and including a signage package to complete the project. JSR chose to break up the large, impersonal public spaces by using wall paneling systems combined with fabric panels that absorb sound, create privacy and add tactile interest. 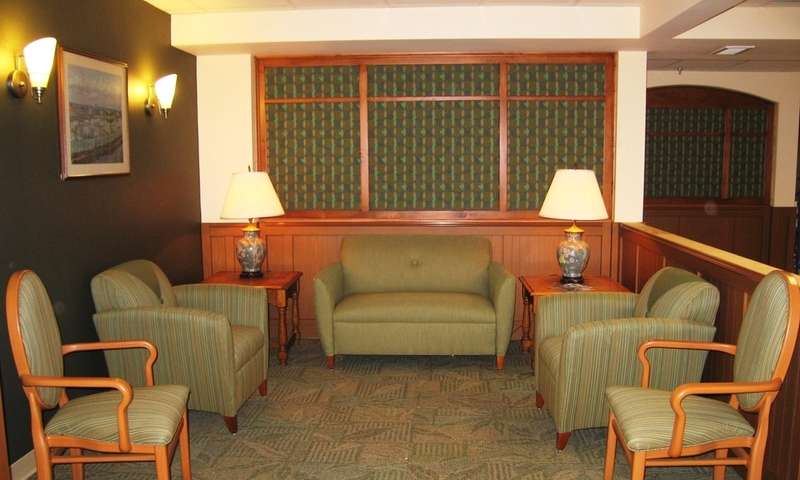 They enhanced the more intimate resident seating areas with flue-less electric fireplaces, desk niches and upholstered seating as well as combining down lights with accent lighting. JSR also designed the Spa for residents with dementia and physical frailty. Using ADA standards throughout, the Spa offers a walk-in bathtub, full access shower and double grab bars at the toilet, while the tile finish is chosen for its spa-like effect and feel. JSR Associates, Inc.’s responsibilities included initial design review with client and administrators for space planning and programming, healthcare model review and consulting, and budget analysis.